I have been waiting for an app like this for quite a while. Synchronization between the iPhone Calendar & Google Calendar. It even supports multiple calendars. The first time syncing took a while but I do have a lot of calendars and events. 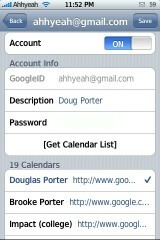 I got a lot of doubled up events because I had the same things on both the iPhone and the Google Calendar. I’m going to clear some out now that it syncs! Once you sync the first time it’s much quicker to sync. 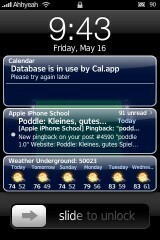 You can also see all the calendars shared to you and choose which one’s will show up on the iPhone. 1. Install GData Client Library from the same source. You can find this under the System category in Installer. 2. Install NemusSync from the Productivity category in Installer. 3. 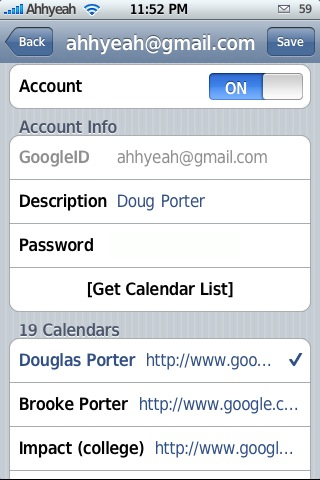 Add a new account; GoogleID includes your @gmail.com; give it any description you’d like; enter your password; tap get calendar list; select calendars; tap save. 4. Select Default Calendar; I assume this means this will be the only calendar written to on Google. That way when you add an event on your iPhone, this is the one it adds it to. 5. Tap Quick Sync Calendars; I haven’t heard the difference between this and Full Sync but I’m guessing a Quick Sync only syncs new changes. Does this have auto-sync like SyncJE recently implemented? I like the auto-sync and haven’t had very many troubles with SyncJE-Goosync combo. I would like to get away from the 30 day out limit of Goosync and no multiple cal support. At this time it is a manual sync but I believe it is a future plan to add auto sync. Thats Cool News Douglas ! 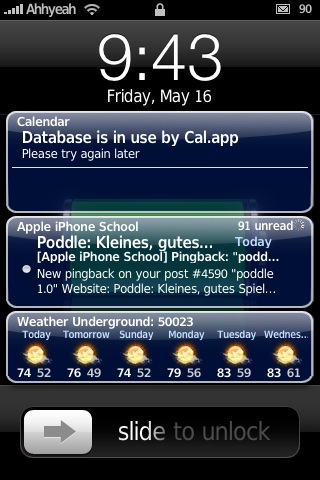 I like the idea of syncing cal/notes/contacts. I see he has notes as a TODO, but with a contacts API I could also see the possibility of syncing those as well. Of course, the way GMail creates a new contact for every new email adress you reply to, it would only be usable if it could sync to a particular group of contacts. Man, finally! I’ve been waiting for this for what seems like forever now. I pretty much run my life from GCal. alas, I’ve run into a problem..
Don’t see the big deal with this app. 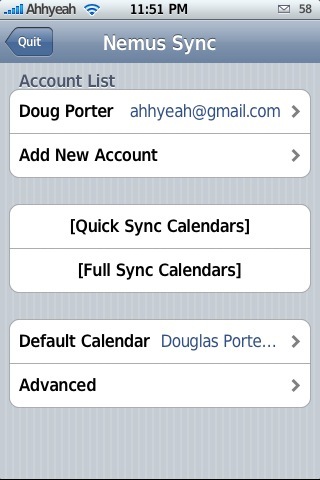 I sync Microsoft Outlook with my iPhone and I get all my contacts and calender in there. Its everything I need. So why would sonmeone want this, what is the difference? Um…for people who don’t have or use Outlook. u can access google calendar from any computer almost anywhere on the planet. Outlook? No thanks, I like my computers without viruses thankyouverymuch. I have the same intelliScreen. Hope they fix that soon. My “All day events” sync up a day behind? Anybody else’s doing the same? Yeah – Mine have been doing the same. It’s too bad ’cause I was so excited as soon as I saw this – I wanted it to be perfect right away. It needs an auto-sync too – I’m sure it’ll come! Ouch! All my items are exactly 9 hours early in my iPhone. E.g. a 20.00 h outlook-event is displayed at 11.00 h in my iPhone calendar. This also causes “all day-events” to be placed one day early (probably because an all day-event starts at 0.00 h). All events exported flawlessly from Outlook to Google Calendar. Is it due to time differences (I’m in Holland)? How to solve this? I’m not sure if you guys ever got a resolution but here goes. I had a similar problem where things were suspciously 3 hrs back on my iphone but right times on GCal. I messed with the iphone and found that ALTHOUGH THE TIME WAS SHOWING CORRECT, THE TIME ZONE WAS INCORRECT (PACIFIC INSTEAD OF EASTERN). Now that I changed it, it matches up to the time zone in GCal and the times are fixed! Hope that helps. Can you combine calendars from iCal and GoogleCalendars on the iphone? I guess if I use the phone to sync, then in a weird way, all three will be in sync, correct? Looks like NemusSync 0.5.3 conflicts with Intelliscreen. Once I installed i got a ical not available error. once I uninstalled, Intelliscreen worked. I had the same problem. You don’t need to uninstall. After syncing your calendar just power off and power on your iphone. Then Intelliscreen works. 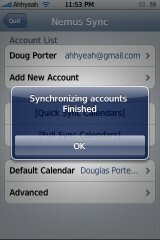 You will have to do this each time you sync your calendar but at least you still get to use NemusSync. Yeah, I have many All Day Events on my calendar, and they are all syncing a day behind. If you open an even that supposed to be all day Friday, it shows it starts Thursday at midnight and ends Wednesday at 11:59pm. I can’t go through and change every single event. Also, it doesn’t sync every event either. Some of my events are being left off. Others will show a dot on the Month calendar on the iPhone but will not actually show an event. I’m gonna have to wait for them to update this before I start using it. This is definitely something I’ve been waiting for, but it needs to work out the bugs. As far as the “database in use….” error, respringing usually fixed that problem for me. nemus sync new update and now it can not only download info from google but also upload it to google. I can’t get nemussync to upload the info to my Google Calendar. I can download fine but if I put in a new event and then sync, nothing happens on my Google Calendar. 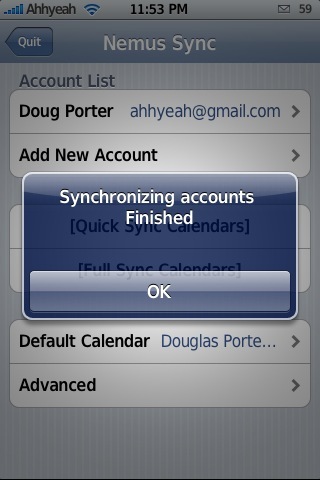 Actually not,I get double events in mine iphone when I sync. 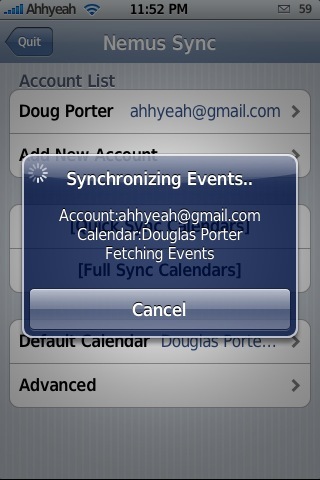 to fix the double events, you can clear out your iphone calendar and then sync by downloading from GCal. Easy, Simple, Fast. Great! Love it. Does nobody care about how this synchronizations happens? Does nobody really care whom we send our gmail login information to? Great solution for u problem i have been dealing with since the launch of the iphone. Thanks ! 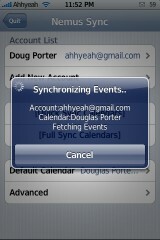 maybe just turn off Outlook Calendar auto sync & use GCalSync from google to sync GCal to Outlook? Do you have a command line option to sync calendars? Instead of pressing “sync calendar”, type something like “./NemusSync –sync”. Does nemus have command line options? HELP ME PLEASE…I tried out this app…i wanted to get rid of it so i deleted the accounts thinking it would just delete my google colander info. 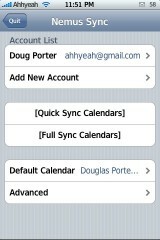 Now itunes doesn’t sync any of my old info and my colander on my iphone is blank! Any suggestions?? I Figured it out…in itunes i checked under the advance tab replace information one time from the computer to iphone…it synced all my icals backup and now syncs perfectly again….that was scary. nevermind…. maybe if i opened my eyes…. See this thread at modmyifone for a fix. This worked for me, but for someone else it didn’t. It’s definitely worth a try though! This works better than syncje. It needs a command-line option. And the ability to sync a small time frame. i.e. 30days ahead 30days in the past. The ability to clear the whole calendar is great. SyncJe will needs that simple feature. PLEASE make this available in the App Store for us non-jb’ers…. I would definitely buy this in a heartbeat. Does NemusSync work on the new iPhone 3G? Any one has had the experience? does anyone know if this app is in the app store. Yea, what is the status with the iPhone 3G with 2.0 software? Agreed. Please get it into the App store. Would love to use it. Bump for 3g and app store listing. Would purchase in an instant! I love this app too, but I doubt this will get past the screening process and be published in AppStore, this app is in direct competition with MobileMe from Apple. Nemusync just released today for fw2.0! I installed it, is shows as an installed program, but doesn’t show up on the springboard. Installed thru Cydia, now able to access it, but syncs keep failing..? Your iPhone needs to be jailbroken (see link under ‘Hack’ at the top of the page for more info on this) The app can then be installed thru Cydia, an installation program that can be used only after jailbreaking. it’s way to slow, and i can’t find the quick sync button, only full sync. The 1st sync takes ages, as it’s getting ALL calendar info from google, subsequent syncs are much quicker. I know it’s manual sync, but I’m stoked about this app! I hate Outlook, and refuse to use it, and while I don’t necessarily *love* Google Calendar, it does exactly what I need. Thank you. I’m SO glad I found it. surfing the internet I found a quick, solid and above all cheap solution. It’s an app, called remote calendar. What made me finally choose for this app was that it can sync a variety of calendars using calDAV with my iphone. Me and my girlfirend are using ical, while in office we are using outlook. With remote calendar I have it all in sync. You should look out for it in the app store. Como sincronizo as tarefas do outlook 2007 com meu iphone 3g. Não tem esta opção no itune só sincroniza calendario/contatos do outlook. I’m missing something somewhere. I can’t get the Default Calendar set. When I click “Advanced,” the screen with the Default Calendar is shown, however it says “NONE,” and I can’t change it. If I select the NONE, then in the next window it says “No Default Calendar” in the white window, with a check mark.” My email address is shown below in in the blue-gray area, then “NONE” in the white window below. HELP!!! Thanks! Thank you for every other magnificent post. Where else could anybody get that kind of info in such a perfect approach of writing? I have a presentation next week, and I’m at the search for such information.